Third of ten children of Vincenzo Bellarmine and Cinzia Cervini, a family of impoverished nobles. His mother, a niece of Pope Marcellus II, was dedicated to almsgiving, prayer, meditation, fasting, and mortification. Robert suffered assorted health problems all his life. Educated by Jesuits as a boy. Joined the Jesuits on 20 September 1560 over the opposition of his father who wanted Robert to enter politics. Studied at the Collegio Romano from 1560 to 1563, Jesuit centers in Florence, Italy in 1563, then in Mondovi, Piedmont, the University of Padua in 1567 and 1568, and the University of Louvain, Flanders in 1569. Ordained on Palm Sunday, 1570 in Ghent, Belgium. Professor of theology at the University of Louvain from 1570 to 1576. A the request of Pope Gregory XIII, he taught polemical theology at the Collegio Romano from 1576 to 1587. While there he wrote Disputationes de Controversiis Christianae Fidei adversus hujus temporis hereticos, the most complete work of the day to defend Catholicism against Protestant attack. Spiritual director of the Roman College from 1588. Taught Jesuit students and other children; wrote a children's catechism, Dottrina cristiana breve. Wrote a catechism for teachers, Dichiarazione piu copiosa della dottrina cristiana. Confessor of Saint Aloysius Gonzaga until his death, and then worked for the boy's canonization. In 1590 he worked in France to defend the interests of the Church during a period of turmoil and conflict. Member of the commission for the 1592 revision of the Vulgate Bible. Rector of the Collegio Romano from 1592 to 1594. Jesuit provincial in Naples, Italy from 1594 to 1597. Theologian to Pope Clement VIII from 1597 to 1599. Examiner of bishops and consultor of the Supreme Sacred Congregation of the Roman and Universal Inquisition in 1597; strongly concerned with discipline among the bishops. Created Cardinal-priest on 3 March 1598 by Pope Clement VIII; he lived an austere life in Rome, giving most of his money to the poor. At one point he used the tapestries in his living quarters to clothe the poor, saying that "the walls won't catch cold." Defended the Apostolic See against anti-clericals in Venice, Italy, and the political tenets of King James I of England. Wrote exhaustive works against heresies of the day. Took a fundamentally democratic position - authority originates with God, is vested in the people, who entrust it to fit rulers, a concept which brought him trouble with the kings of both England and France. Spiritual father of Saint Aloysius Gonzaga. Helped Saint Francis de Sales obtain formal approval of the Visitation Order. Noted preacher. 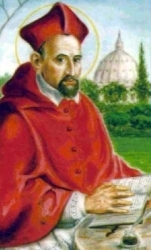 Archbishop of Capua, Italy on 18 March 1602. Part of the two conclaves of 1605. Involved in disputes between the Republic of Venice and the Vatican in 1606 and 1607 concerning clerical discipline and Vatican authority. Involved in the controversy between King James I and the Vatican in 1607 and 1609 concerning control of the Church in England. Wrote Tractatus de potestate Summi Pontificis in rebus temporalibus adversus Gulielmum Barclaeum in opposition to Gallicanism. Opposed action against Galileo Galilei in 1615, and established a friendly correspondence with him, but was forced to deliver the order for the scientist to submit to the Church. Part of the conclave of 1621, and was considered for Pope. Theological advisor to Pope Paul V. Head of the Vatican library. Prefect of the Sacred Congregation of the Rites. Prefect of the Sacred Congregation of the Index. Proclaimed a Doctor of the Church on 17 September 1931. At a time when few women wrote, Hildegard produced major works of theology and visionary writings. When few women were respected, she was consulted by and advised bishops, popes, and kings. She used the curative powers of natural objects for healing, and wrote treatises about natural history and the medicinal uses of plants, animals, trees and stones. She is the first musical composer whose biography is known. She founded a vibrant convent, where her musical plays were performed. Interest in this extraordinary woman was initiated by musicologists and historians of science and religion. Unfortunately, Hildegard's visions and music have been hijacked by the New Age movement; New Age music bears some resemblance to Hildegard's ethereal airs. Her story is important to students of medieval history and culture, and an inspirational account of an irresistible spirit and vibrant intellect overcoming social, physical, cultural, gender barriers to achieve timeless transcendence. Hildegard was the tenth child born to a noble family. As was customary with the tenth child, which the family could not count on feeding, and who could be considered a tithe, she was dedicated at birth to the Church. The girl started to have visions of luminous objects at the age of three, but soon realized she was unique in this ability and hid this gift for many years. At age eight her family sent Hildegard to an anchoress named Jutta to receive a religious education. Jutta was born into a wealthy and prominent family, and by all accounts was a young woman of great beauty who had spurned the world for a life decided to God as an anchoress. Hildegard's education was very rudimentary, and she never escaped feelings of inadequacy over her lack of schooling. She learned to read Psalter in Latin, but her grasp of Latin grammar was never complete (she had secretaries help her write down her visions), but she had a good intuitive feel for the intricacies of the language, constructing complicated sentences with meanings on many levels and which are still a challenge to students of her writing. The proximity of the Jutta's anchorage to the church of the Benedictine monastery at Disibodenberg exposed Hildegard to religious services which were the basis for her own musical compositions. After Jutta's death, when Hildegard was 38 years of age, she was elected the head of the budding convent that had grown up around the anchorage. During the years with Jutta, Hildegard confided of her visions only to Jutta and a monk named Volmar, who was to become her lifelong secretary. However, in 1141 a vision of God gave Hildegard instant understanding of the meaning of religious texts. He commanded her to write down everything she would observe in her visions. Though she never doubted the divine origin of her visions, Hildegard wanted them to be approved by the Church. 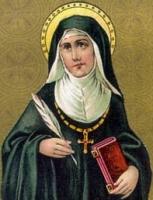 She wrote to Saint Bernard who took the matter to Pope Eugenius who exhorted Hildegard to finish her writings. With papal imprimatur, Hildegard finished her first visionary work Scivias ("Know the Ways of the Lord") and her fame began to spread through Germany and beyond. The 12th century was also the time of schisms and religious confusion when anyone preaching any outlandish doctrine could attract a large following. Hildegard was critical of schismatics, and preached against them her whole life, working especially against the Cathari. Declared a Doctor of the Church on 7 October 2012 by Pope Benedict XVI. Son of Gerard Felinski and Eva Wendorff, the third of six childen in a proudly patriotic Polish family. Two of his siblings died as children, and his father died when Sigimondo was 11 years old. His mother was arrested and exiled to Siberia in 1838 for her pro-Polish politics and for working to improve the economic conditions of farmers. Sigimondo studied mathematics at the University of Moscow from 1840 to 1844, and French literature at the Sorbonne and College de France from 1847. There he became friends with Polish emigres, writers and nationalists, and involved in the failed revolt of Poznan in 1848. Tutor to the Brzozowski family in Munich, Germany and Paris, France from 1848 to 1850. Entered the diocesan seminary of Zytomierz, Poland in 1851, and then studied at the Catholic Academy of Saint Petersburg. Ordained on 8 September 1855. Assigned to the Dominican parish of Saint Catherine of Siena in Saint Petersburg from 1855 to 1857. Spiritual director and professor of philosophy of the Ecclesiastical Academy. Founded the charitable group Recovery for the Poor in 1856. Founded the Congregation of the Franciscan Sisters of the Family of Mary in 1857. Archbishop of Warsaw, Poland on 6 January 1862, arriving there on 9 February 1862. The city had been under a state of seige by the Russians since 1861, and the churches had been closed for months. On 13 February 1862 Sigismond reconsecrated the cathedral of Warsaw, and on 16 February he re-opened all the city's churches. Warsaw continued in upheaval with regular clashes between Russian and Polish nationalist forces. He reformed parish life in his see, revitalized charities, revamped the seminary teaching, worked to free imprisoned priests, helped start parochial schools and an orphanage, and though he worked for elimination of government meddling in the Church, the Russians circulated the rumour that Sigismondo was a spy, undermining his authority. Following the bloody repression by the Russians of the January Revolt of 1863, Sigimond resigned from the Council of State, wrote to Emperor Alexander II urging an end to violence, and protested against the hanging of the Capuchin Father Agrypin Konarski, chaplain of the "rebels". In return, he was deported to Jaroslavl, Siberia on 14 June 1863 where he spent 20 years in exile. In the refugee camps, he worked to organize the priests and charitable work among his fellow prisoners, even building a church. Lengthy negotiations between Moscow and the Vatican resulted in Sigimondo being freed in 1883. On 15 March 1883, Pope Leo XIII transferred him to the titular see of Tarsus where he lived his final 12 years in semi-exile in southeastern Galizia at Dzwiniaczka ministering to Ukranian and Polish peasants, building a church, parochial school, and a convent for the Franciscan Sisters of the Family of Mary. Youngest of three children born to Carlo Sgorbati and Giovannina Teresa Vigilini; she was baptised almost immediately after birth at her parish church of San Savio. The family moved to Milan, Italy on 9 October 1950 when Leonella was 9 so her father could find work; he died less than a year later on 16 July 1951 when Leonella was 10 years old. She felt a call to religious life and missionary work in her mid-teens, but at her mother's request she waited until age 20 to make a final decision. She joined the Consolata Mission Sisters in San Fre, Cuneo, Italy on 5 May 1963, making her profession in November 1972, and taking the name Sister Leonella. She studied nursing from 1966 to 1968. Assigned to Kenya in September 1970, she worked at the Consolata Hospital Mathari in Nyeri, and the Nazareth Hospital in Kiambu from 1970 to 1983; part of her work was as a midwife. After additional training, she began teaching nursing in Nkubu Hospital in Meru, Kenya in 1985. Regional superior of the Sisters in Kenya from November 1993 to 1999. In 2001 she began work on what would become the Hermann Gmeiner School of Registered Community Nursing attached to the SOS Children's Village hospital in Mogadishu, Somalia; it opened in 2002 with Sister Lenoella in charge and conducting part of the teaching. Following a trip to Italy in 2006, she had trouble being allowed back in to Mogadishu as Islamic courts had taken control of the area; she managed to return to her work at the hospital on 13 September 2006. Sister Leonella and her guard and driver, Mohamed Osman Mahamud, a Muslim father of four, were murdered four days later in retaliation for Pope Benedict XVI having quoted a 600-year-old text that dismissed the contributions of Islam, gunned down in the street as she walked from the children's hospital. She died forgiving her attackers. Martyr. Born to the nobility, the son of Aper and Herisplindis, he received a good, religious oriented education. Student of Saint Landoaldus and Saint Theodardus. Priest. Bishop of Maastricht, Netherlands in 670. Forced for political reasons into exile from Maastricht from 674 to 681. Missionary in Toxandria (modern Brabant) with Saint Willibrord of Echternach in the late 7th century. Apparently worked with Saint Wito, Saint Plechelm of Guelderland, and Saint Otger of Utrecht. With Saint Landrada, he founded the abbey of Munsterbilsen. Murdered for defending the sanctity of marriage, which was very politically inconvenient for several powerful people of the day. Martyr. Priest. Founded the Marian Clerics of the Immaculate Conception of the Virgin Mary. Born to the nobility, the son of Antonio Arbues and Sancia Ruiz. Studied philosophy at Huesca, Spain. Studied canon law at the University of Bologna. Augustinian canon at Saragossa, Spain in 1478. Inquisitor of the Aragonregion of Spain in 1484. Forcibly converted Jews and Marranos (converts to Judaism) to Catholicism, which was considered acceptable at the time. Murdered by a group of Marranos. Born to a pious family; her brother was an abbot, and her sister and brother-in-law founded a double monastery at Tabanos, Spain. Her father died when Columba was still living with her parents. Her mother wanted the girl to marry, but Columba was drawn to religious life, and entered her sister's monastery at Tabanos. During the Moorish persecutions of Christians in 852, most of the nuns of Tabanos fled to Cordova. Columba refused to run, and made a public proclamation of her faith to a Moorish magistrate. Martyr. Raised Catholic. Soldier. Seminarian with the Paris Foreign Mission Society. Ordained at Pong-King. Parish priest in the apostolic vicariate of Cochinchina. Arrested for his faith while visiting his mother. One of the Martyrs of Vietnam. Parish priest of the archdiocese of Warsaw, Poland. Beloved spiritual advisor. Martyred in the Nazi persecutions. Older brother of Saint Ambrose of Milan and Saint Marcellina. Lawyer. Prefect of an imperial Roman province. Handled the administration of his brother's household and finances. Noted for his sense of justice, his integrity, and his generosity. 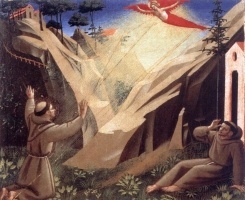 While in meditation on Mount Alvernia in the Apennines in September 1224, Saint Francis received a vision of a six winged angel. Francis saw that the angel was crucified. When the angel departed, Francis was left with wounds in his hands, feet, and side as though he had been crucified. The wound in his side often seeped blood. Monk. Priest. Missionary to Germany. Monk at Tholey Abbey near Trier, Germany. Founded the Wasloi Abbey in the forest of Argonne, France. Owned a house in Rome, Italy that Saint Lawrence of Rome used as a base to distribute alms to the poor after Lawrence had miraculously cured his blindness. Martyr. Monk at New Corvey Abbey. Archbishop of Bremen-Hamburg, Germany in 917. Evangelized Sweden and Denmark. Priest. Martyred for giving Christian burial to the bodies of martyrs. Wealthy member of the imperial Roman nobility who spent largely from her fortune to support fellow Christians during the persecutions of Diocletian. Martyr. Christian slave of a non-Christian master. Tortured, tried, mutilated and executed for her faith. Martyr. Young man martyred in the persecutions of Marcus Aurelius. Seventh century abbot of Ross Tuirc, Ossory, Ireland. Author of a hymn to Saint Brigid. 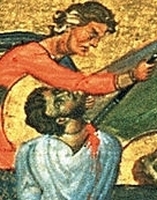 Early martyr venerated in England.